The movie King of Hearts was originally released in 1967 but gets a 4K restoration and theatrical rerelease from Cohen Media Group. In October, 1918, near the end of World War I, Private Charles Plumpick (Alan Bates) , a gentle French-born Scottish soldier, is sent by his British Allied commanding officer to disarm a bomb that has been planted in the French town of Marville by the retreating German army. As the battle comes closer to the town, its inhabitants flee, leaving the asylum gates open and allowing the inmates to leave their institution and create their own eccentric community in the town. 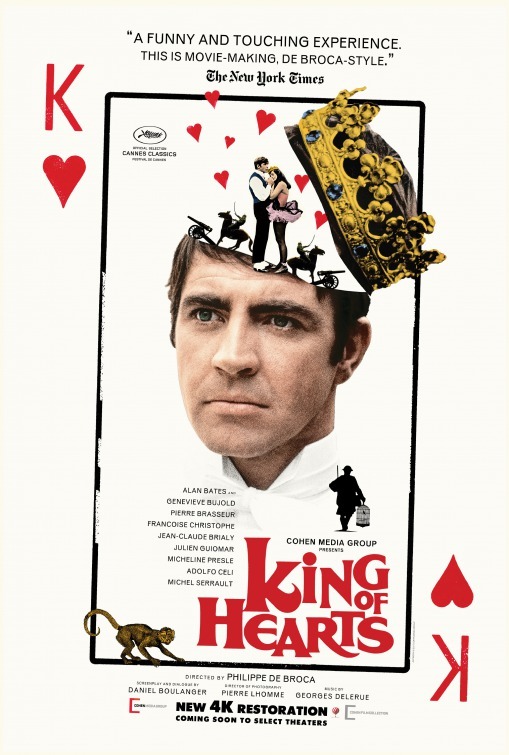 Soon after Plumpick arrives, he gets caught up in the lives of the good-natured inmates, who crown him “King of Hearts” with a surreal coronation. Plumpick falls in love with a beautiful inmate (Geneviève Bujold) and the others plan a wedding as he tries to find the bomb before it goes off. He finally does find the bomb and disarm it, prompting both German and British troops to return to the town and slaughter each other in an all-out massacre. The bloody and unnecessary battle leaves Plumpick weighing the horrible insanity of war against the arguably more benign brand of “lunacy” represented by the inmates. Fifty years after its original release, this satirical look at the absurdities of war is presented in a gorgeous new 4K restoration for modern audiences to discover. In the movie War Machine, writer-director David Michôd (Animal Kingdom) recreates a U. S.